Most of us become readers at an early age and discover the wonders of a good story. We learn to interact with books in order to learn and grow. Characters come alive to us as we relate to their experiences. Sometimes reading is for pleasure or escape and other times it is for the disciplined acquisition of information. No matter what, our engagement with literature and written word has the potential to change us, calm us, inform us, inspire us and heal us. In its most simplistic form, this is known as bibliotherapy. Exposure to books, poetry, writing, and even film and videos can be therapeutic and beneficial in helping us process our own life experiences. In other words, literature can be used to help us figure life out, heal emotional traumas, and change thoughts and behavior. Reading can be a healing experience. As I was learning to adjust to vision loss, I was drawn to read books about blindness and books written by authors who were blind. I found it very helpful and motivating to enter the narratives of others who were sharing their own stories of vision loss. Some books were informational, some humorous, and others deeply moving. I realized that the cumulative affect was that I understood more about blindness and my feelings about it were changing. Reading books on blindness, memoirs and biographies of blind writers has had a very positive influence on my ability to adjust and cope with vision loss. It has long been understood that literature “heals the soul” and the use of bibliotherapy has evolved to become quite complex in its application to psychiatry and health care. Consider a bit of reading therapy for yourself as a way to deal with vision loss. With the help of the Peer Advisors at VisionAware, I put together a reading list of books for this purpose. It is not exhaustive by any means but meant to get you started. Most of these titles are available through the National Library Service in audio or braille formats. Newer titles are not yet available through the NLS. Many are available in e-book formats through your favorite booksellers. (Kindle, Nook, etc.) Another way to find such books on blindness is to search the NLS collection using “blindness” as a key word. Whether you are using your eyes, ears or fingers to read, may it be a rewarding and therapeutic experience. Is there a book you have read that helped you adjust to vision loss? How did the book help you? Or is there a book about a blind person that was encouraging or motivational? What about books written by a blind or visually impaired author? Share your favorite reads below. I am always amazed when I download a book on my BARD (Braille and Audio Reading Downloads) Mobile app and can immediately start listening. I browse the expansive BARD library, search for specific book titles or authors, add books to my “Wish List,” and begin reading in minutes. It is like magic, this wonderful bit of technology at my fingertips and I am so grateful to have access to reading material in this format. Recently, I read that The American Foundation for the Blind (AFB) played an instrumental role in the development of the National Library Services for the Blind and Physically Handicapped (NLS), true to their mission to advocate for education and access to information for the visually impaired. This piqued my interest and I discovered a fascinating history of the NLS and the Talking Book Program. It can be found on the AFB website ( http://www.afb.org/info/75-years-of-afb-and-talking-books/2) and in the book “The Unseen Minority: A Social History of Blindness in the United States” by Frances A. Koestler (available through the NLS and AFB). This legislation enabled Braille books to be systematically printed and loaned through regional libraries, funded by the government. As the numbers of blind adults grew as a result of war, there was increased need to produce and circulate more reading material efficiently. This coincided with new technologies being developed to record spoken word. AFB partnered with engineers, commercial recording studios, the Library of Congress, Helen Keller, and American Printing House (APH) to bring to fruition the Tallking Book Program in 1934. Through determined effort, recorded books and play back machines were made available through regional libraries to the visually impaired community all over the United States, on free loan. AFB began recording Talking Books for the Library of Congress and among the first were the Four Gospels and the Psalms, the Declaration of Independence, and some works of Shakespeare. AFB continued to participate in the mission of bringing literature, magazines and other reading materials to the blind even as new technologies evolved. In 1936, Talking Books were made on Vinylite LP records played on phonographs built by blind workers in one of Roosevelt’s Work Progress Administration (WPA) workshops run by AFB. By the 1950’s, alternative formats were being developed to record books on cassette tapes and reel-to-reel. 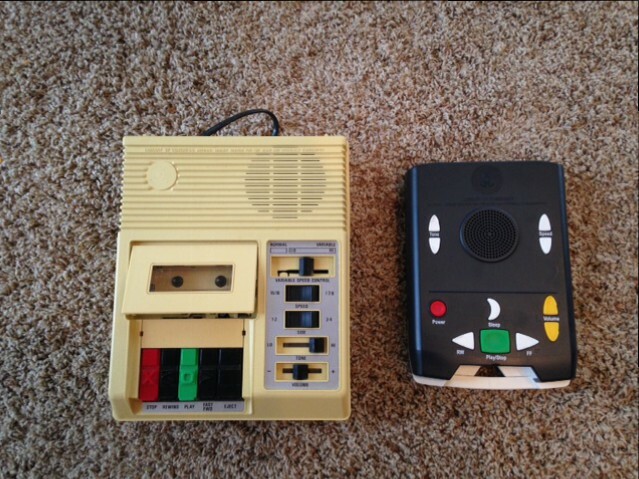 Talking Books on cassette tapes with the accompanying machines, were the preferred format distributed by the 1980’s. Then in the 1990’s, digital technologies drove the AFB and the Library of Congress to launch a test program to introduce digitally recorded books and digital players. The conversion to a digital Talking Book system began in 2007. From there, we have BARD Mobile today; books downloadable on digital players and i-devices instantly at our fingertips. Isn’t it grand, to be able to enjoy a book with clear digital technology, easy navigation, and available on-demand? It always causes me to pause to consider what an amazing time we live in and to give thanks to all the tireless efforts of those who went before us, advocating for this access to printed word. Thank you AFB and Helen Keller! And now , I must get back to my Talking Book-“State of Wonder” by Ann Patchett.